A perfect match was found between the intimate setting at the Cabot's newly renovated 850 seat, former 1920's art-deco period theater in Beverly, Ma. 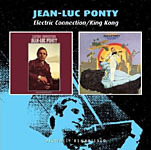 and the soaring, melodic and mesmerizing sounds of masterful electronic jazz-rock French violinist Jean-Luc Ponty. 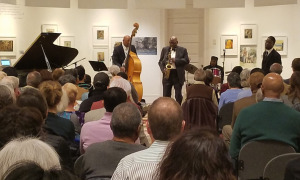 The venue offered the perfect fit, creating an atmosphere for a listener's audience ready to appreciate the extraordinary talents of this highly respected, classically trained, multi-award-winning jazz violinist and seminal Atlantic Records recording artist. 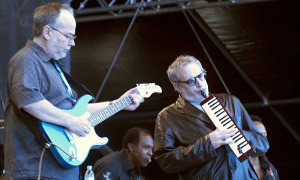 Ponty, on the final leg of his US tour started in June (2018), has performed and composed over his career with many other renown musicians and composers including Frank Zappa, John McLaughlin and the Mahavishnu Orchestra, George Duke, John Lewis of The Modern Jazz Quartet and collaborated with Allan Holdsworth, Chick Corea, Al Di Meola and Stanley Clarke. 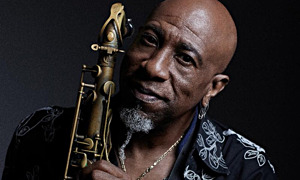 But tonight's treat was to go back in time with the "cosmic messenger" and hear his live solos, interpretive repertoire and selections from albums, particularly from the '80s and '90s, (Imaginary Voyage, Enigmatic Ocean, A Taste for Passion, and, of course, Cosmic Messenger), that set a very high bar in the jazz-rock fusion world with Ponty's unique tone and often synthesized affect and masterful command of the electronic violin. 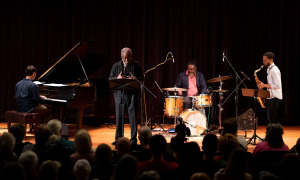 The audience experience was a double-treat with the performance including members of his original band from the Atlantic years: Jamie Glaser, Wally Minko, Keith Jones and Rayford Griffinall from the stellar album release period of Ponty's '80s recordings. Starting the evening with an on-stage ovation, as fans welcomed Ponty back to Beverly, the master on the electronic violin wasted no time and launched into two soaring renditions of favorites from Enigmatic Ocean, "Overture" which segued into "Trans Love Express" and then to instant recognition and applauseas the intro to the title cut from Cosmic Messenger began, probably Ponty's most "signature" composition that features his long sustained synthesized notes on the violin and a mystical rhythm and dreamy solo statements by Ponty. 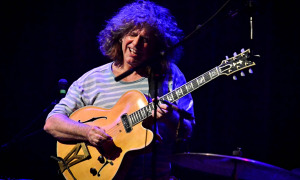 Guitarist and long-time band mate Jamie Glaser stepped forward to take superlative scale runs and emotionally sustained notes that rang off his busy fretboard. 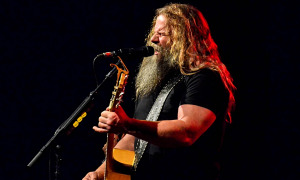 Moving onto A Taste for Passion, Ponty featured the beautifully serene "Stay With Me," which offered more soloing give and take between musicians. A jaunt into a blues number "Modern Times" from Open Mind changed the tempo and then back to two choice cuts from standards, "The Struggle of the Turtle to the Sea"(Enigmatic Ocean) and "Once a Blue Planet" (Civilized Evil). 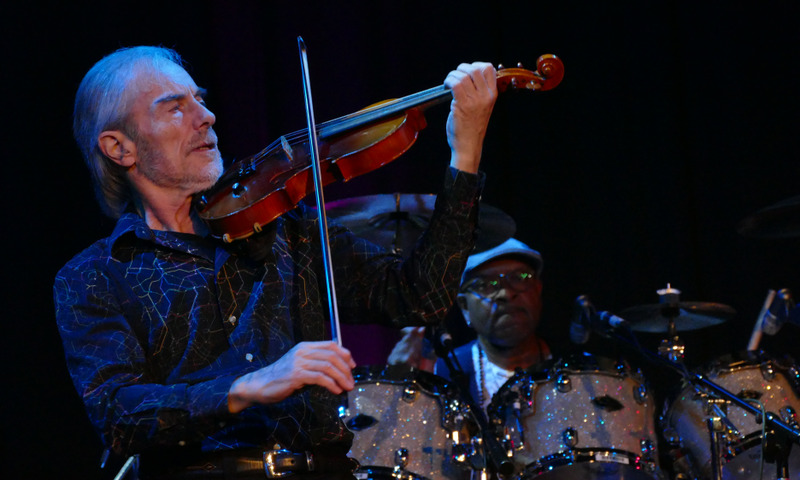 "The Struggle of Turtle to the Sea," opening with a four-beat impassioned statement on keyboards, and then mirroring guitar and the pace lifting-off Ponty's violin was, quite simply, mesmerizing. "Once a Blue Planet" featured the beautiful moody keyboard introduction by Wally Minko, and remorseful acoustic guitar-picking notes from Glaser and slow mournful refrain of saturated tone from Ponty's violin. The deeper meaning referred to in the title of these two pieces was carried by the music, listened to in the moment, and delivered by its messenger and bandmates. 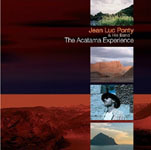 After a magnificent intense sustained drum solo by Rayford Griffin and later dueling solos between Ponty and dexterous bassist Keith Jones, the evening finished-off with several other top-shelf selections by Ponty: "Mirage," "Jig" and finally "Gardens of Babylon" and the title cut from Enigmatic Ocean. 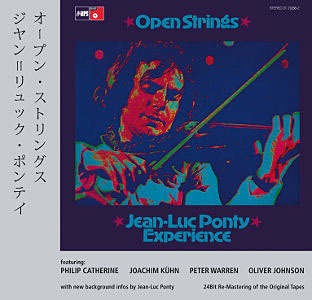 Each song showing time-tested merit and force of arrangement, individual musicianship and finally, the sustained lead electric violin statements by Ponty. 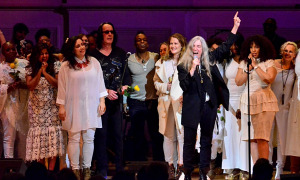 A magical sound was present on-stage for the evening, with a channeled and in-sync group of musicians, particularly on display for these selections. A superb offering by the artist from his Atlantic Records recording years. 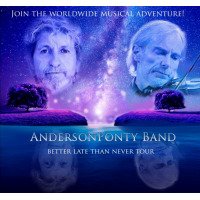 Ponty can conclude this "final" tour knowing that his band and compositions will have set themselves apart, in a special place, from other reigning jazz-rock fusion bands of his time.